Many people still ask me how I found work as a traveling yoga teacher. Like mostly everyone I didn’t sign up for my first yoga teacher training to become a yoga teacher – I was more interested in the self-development and learning more. But as it turned out, I really loved teaching yoga and I knew I wanted to travel and become a “real” traveling yoga teacher. On my next trips to Bali I focused on my own yoga practice – visiting lots of yoga classes, workshops and more trainings – and also took every opportunity to teach yoga and gain experience. This meant filling in as a last-minute replacement as yoga teacher at a surf yoga retreat, teaching donation-based community yoga classes for free and subbing classes and starting to teach yoga classes at a beach in Gili Meno. I jumped at every opportunity to work as a traveling yoga teacher, even if I was slightly terrified each time. Teaching yoga abroad has a lot of benefits. Teaching yoga in a foreign country gives you the chance to see new places, try new foods, and to learn from other cultures. It’s also a great way to connect with other yoga teachers and students worldwide. And let’s not forget that the costs of living are much cheaper, especially in South East Asia, so you might actually be able to support yourself as a fresh yoga teacher and gain valuable experience. 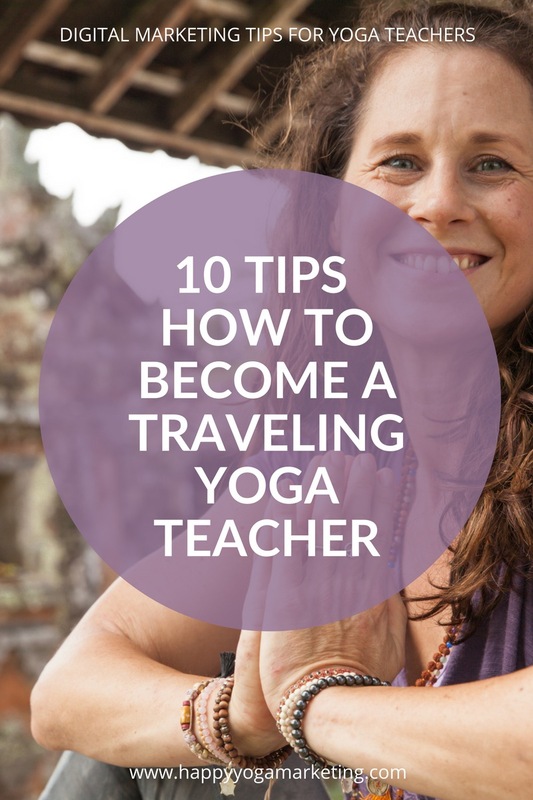 If you’re ready to pack your backpack and hop on a plane to South-East-Asia with your yoga mat, check out my 10 tips how to find a job as a traveling yoga teacher. 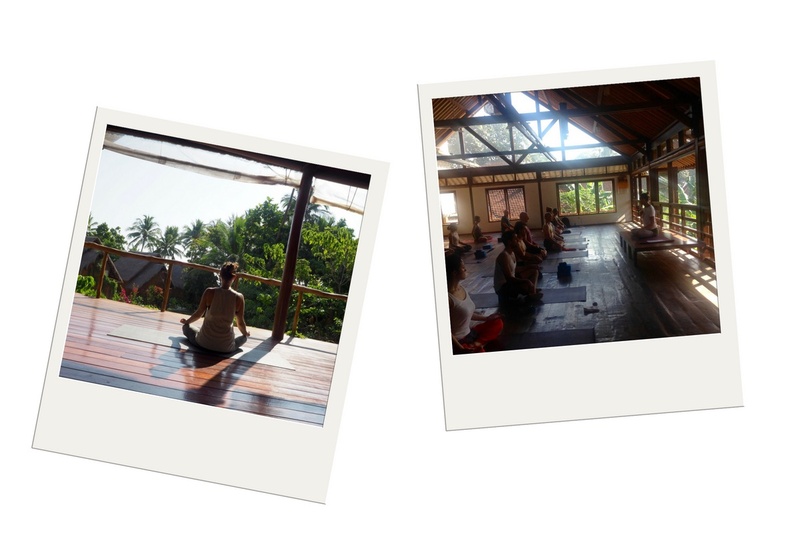 Very often overlooked but I think it’s one of the best ways to find a job teaching yoga and it’s how I got the opportunity to teach free community yoga classes at Radiantly Alive Yoga in Ubud (this was a few years ago, due to the stricter immigration laws it’s much harder to get a job teaching yoga in Bali today). When traveling, visit yoga studios wherever you are, and you will find a place that resonates with your heart. Go back often, become friends with the staff and teacher and offer to sub classes if they need someone to fill in. Give it time, be patient and you might find your yoga dream job as a traveling yoga teacher. There are also a few Facebook groups, like this one. You could also apply at a yoga retreat as a volunteer or karma yogi. Not all of them will give you the opportunity to teach, though, so if this is your goal make sure that you’ll get the chance before you sign up. This is one of my secrets to actually getting the best jobs teaching yoga abroad! And it’s the one thing that will make sure you stand out from the competition. Even if you don’t have tons of teaching experience yet, a well-designed CV will give the impression that you are professional, reliable and take your job seriously. And believe me, for an employer that’s just as important as your teaching experience. A short text about you and your teaching style. Information about your yoga education: list all the trainings and workshops that you’ve done. If that would fill a book, focus on the 10 most important ones. 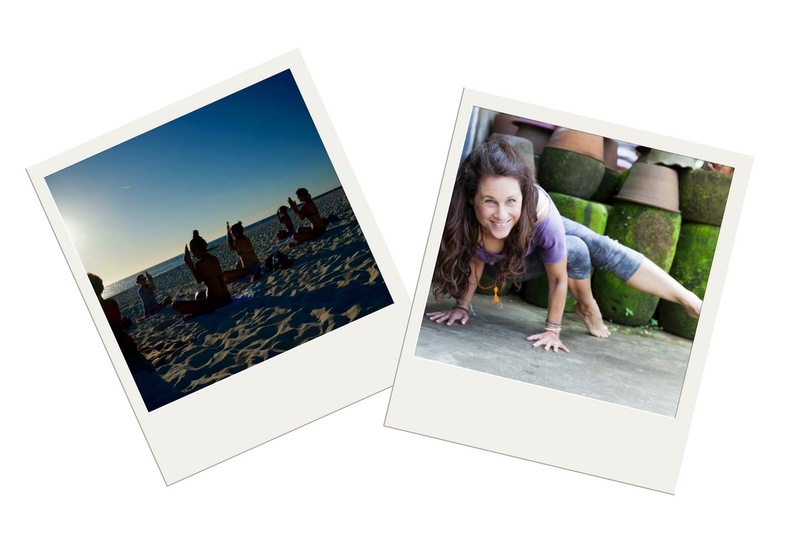 Your teaching experience: list all the places where you taught yoga before. If you’ve never taught yoga at a yoga studio before, don’t fret. What about private classes that you taught your friends? Write about that. Write about your passion for yoga and sharing it, how you can’t wait to teach more, how you loved practicing teaching in your yoga teacher training. Be real and authentic and you’ll get your chance. Your life experience: Include what you did before teaching yoga. You don’t have to add information on your complete pre-yoga work-life, but the main points. It will help your future employer get a picture of who you are, and it might even help your application. For example, if you have a background in marketing and the yoga center is looking for some support with their social media activities, you might stand a better chance of getting that position. Lastly add some good images of you, a portrait and some yoga shots that show the level of your practice. I recommend getting a good photographer to help you with that. You can use Keynote, Word or Google Docs or even www.canva.com – they have beautiful templates for CVs. The market for teaching yoga is becoming more saturated every day, which makes it important to define your profile as a yoga instructor and get clear on your niche. Try to define what you stand for. Strong vinyasa flow classes? Gentle hatha yoga with an Iyengar focus? Traditional Ashtanga? Yin and restorative yoga? Kids yoga? Maybe you’re bilingual and can teach in more than one language. Whatever it is, find what makes your offering unique to set yourself apart from the rest. I recommend getting a website as soon as possible, so people can find you online and learn more about you. It will also look more professional when you apply for jobs as a traveling yoga teacher. Your website doesn’t have to be crazy expensive or fancy. 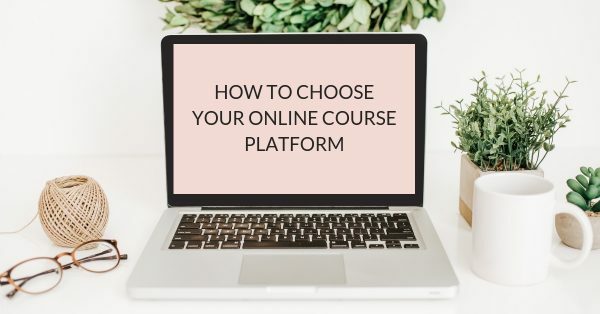 Start with Squarespace or have a look at my course Build Your Yoga Website where I show you step-by-step how to build a beautiful WordPress website. Network with studio owners and yoga teachers you meet and anyone else who could help you find a local teaching gig. Word of mouth is one of the best ways to lead you to opportunities. 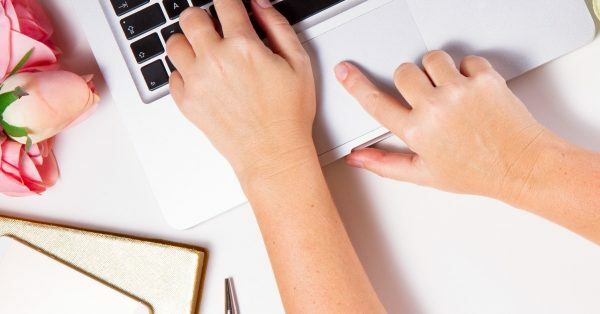 Social media is great to stay in contact and to connect with other yoga teachers on a similar path. Let me give it to you straight… A three-week training doesn’t make you a yoga teacher. Only practice does. Volunteering is a great chance to gain valuable experience and confidence in your teaching abilities. I loved teaching free community yoga classes at Radiantly Alive Yoga in Ubud and jumped at every opportunity. When I was volunteering in Cambodia I got to teach between 1 and 3 classes a day and my teaching skills made a big step forward. Having said that, I think if you’ve been teaching for longer you should always ask for payment. We all have to make a living and yoga teacher training is expensive. Many yoga teachers don’t like to talk about money and contracts and I get that. But it’s important, so please don’t skip this step and get clear on your yoga work arrangement. 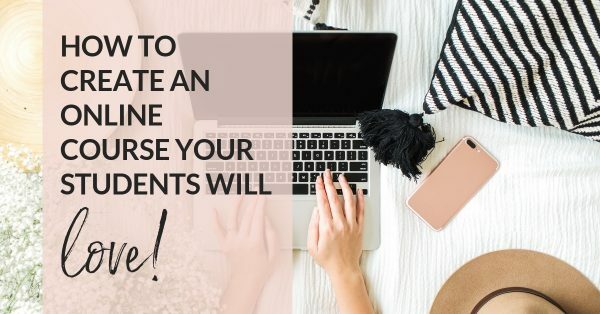 A written contract is best, but if you don’t get one (which is quite common) make sure you understand payment structure (How much will you be paid? Per student or per class? A percentage? ), when you will be paid, and what is expected of you. Don’t forget to note down phone numbers and contact details for the studio in case of emergencies. When you’re looking for jobs as a traveling yoga teacher, you will not be allowed to work officially in most countries you travel to as a tourist. And work visas are very often expensive and difficult to get. Always do your research. Will your employer help you with your visa or is the risk solely on your shoulders? What could happen when you work illegally? Be aware of your situation and maybe don’t advertise your new job proudly on social media when officially you are not allowed to work in that country. As Patthabi Jois said: “Practice and all is coming”. For me it’s the most important part of becoming a yoga teacher. Never forget your own practice, visit workshops and classes, study anatomy and yoga philosophy. Stay open and interested. Yoga is a never-ending journey and we are all just beginners. Have you worked as a traveling yoga teacher or are you looking for your first chance to teach yoga abroad? Let me know in the comments.